There you go folks. Google has spilled the beans about its latest and grandest plan of conquering our lives. Google has just launched Google TV. This time Google is aiming to bring web contents we enjoy consuming on our computers to the sweetest spot in our homes – those areas where we sit back, relax and enjoy watching TV shows and programs. But exactly is Google trying to bring in here? It’s not a TV set. It’s not a TV media player but what Google has been known for – software platform. And for Google TV, Google is interweaving the web and TV into a single platform. Google TV will let us watch contents we enjoy from the web. It has Â a built-in search with auto-suggest function, a web browser in Google Chrome, a TV homescreen console, and most importantly it has Android running in the background. How will Google TV change our viewing habits? And how will it affect commercial TV programs. For our TV viewing habits, Google TV will give us more choices and possibly more TV viewing time. For commercial TV programs, this is like Google hauling competition. Google TV might blur the thin line that separates canned TV programs, to freely available online entertainment content. So, what’s the big plan? Google is working with Sony and Logitech to bring in Google TV on set-top boxes, Blue-Ray players and other media hardware. Google is also releasing the Google TV SDK and web APIs to let third-party developers create more exciting and fun apps that will run alongside Google TV. It’s going to be fun and exciting in the next few days. Google TV is certainly going to make waves. And if Apple rocked the tablet world recently, Google will certainly rock the TV world soon as well. Are you a fan of Oprah? Well, now you can check out your fans whereabouts as well as connect with her whenever and wherever through Oprah Mobile. Developed by Hands-on Mobile, Inc. Oprah Mobile is a suite of mobile applications that you can use whether you have an iPhone, Android phone, Palm Pre or BlackBerry. Oprah Mobile will let you access video clips and previews of Â The Ophra Winfrey Show as well as quickly find out what time and channel the show is playing in your current location anywhere within the U.S. The app also lets you participate in exclusive weekly polls, listen to audio clips, read articles and view photo galleries and highlights from Oprah.com, the Oprah magazine and Oprah Radio. Yes, even keep with up Oprah’s tweets. Additionally, Â if you’re keeping an eye on show tickets, the app can also alert you whenever these become available. And for its social sharing features, Oprah Mobile also lets you share your favorite items via email, Facebook and Twitter, search by guests and contributors, sign the pledge to make your car a No Phone Zone and customize the menu to keep your favorite sections with easy and quick reach. Excited about this app? Get it for your iPhone, BlackBerry, Palm Pre or Â search for it from the Android Market on your Android phone. Nintendo and Netflix are treating Wii users all over the world with free streaming of TV and Movies on TV sets via Netflix services. The new TV and movie streaming services are provided free of charge to Wii users with existing Netflix plans starting at $8.99 monthly. With a Nintendo Wii connected to a broadband service, a Netflix subscription you can practically turn your Nintendo Wii into a multimedia device. We’re talking here of unlimited movies and TV shows delivered courtesy of Netflix. Â You can also opt to receive DVDs delivered straight to your door step. Certainly this new service will boosts Netflix’s clout in the home entertainment scene. The Nintendo Wii remains to be the most popular gaming consoles, thanks to its motion controls which users find useful for both exercising and gaming controls. As for Nintendo Wii, this new service extends its purposes and functions from a mere gaming machine to a portable multimedia entertainment device. It’s definitely a win-win for both parties. 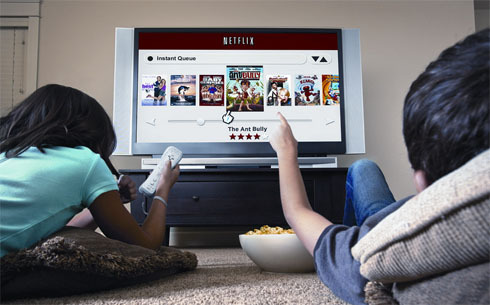 To have streaming TV shows and movies from Netflix on your Nintendo Wii, you simply need to request for a free instant streaming disc from www.netflix.com/wii. Once you have your CD, you can pop it inside your Nintendo Wii and you will presented with a catalog of movies and TV shows that you can freely watch. What? You didn’t get the iPad? Â Oh, right you’re not an Apple fanboy. You’d rather spend on a more powerful tablet such as the one previewed recently by HP, right? Well, just like you HP is also pinning its hope of capturing the tablet market and perhaps taking the thunder away from the iPad with its HP Slate product. And as if telling all of us that the HP Slate project is still alive and well on its way to final production, HP has released a new video demo right on its HP Vodoo Blog. And boy what a tablet the HP Slate really is! Design-wise, it looks so handsome although I’m guessing that it will probably be thicker than the iPad. The HP folks say that aside from the HP Slate’s capability to support Adobe Flash and Air, they have also paid some good attention to the HP Slate’s functionality for consuming media or digital content, be it a story from a major news outlet or or your videos and photos. Obviously HP is banking on the iPad’s shortcomings such as the lack of front facing camera and USB port to make the HP Slate the preferred tablet instead of the iPad. HP was highlighting the fact that the HP Slate will allow you to chat with friends via Skype or share your photos from the HP Slate to Facebook or Flickr. So, it would be interesting to see how the HP Slate can match up with the hype and buzz that the iPad has generated. Of course we all know that there are as much Apple fanboys as there are PC guys out there, willing to take the HP Slate. Â Which side are you on?